My name is Oluyelu Olalekan Olajide Oluwalonimi (Jnr), I studied Finance from the University of Lagos. I am the CEO Bond and Templers Limited (Lagos & Johannesburg). We use the PTY in South Africa, I have been in the advertising industry since 2000 and I thank God for where he has taken Bond& Templers Limited to; we have been able to achieve so many feats by his grace. Yes, a lot. You know that sometimes when you have everything at your disposal, you might not be focused or understand the basics of life. I resolved early in life not to work for anybody when I clock age 40 and that was accomplished to the glory of God. I resigned from my previous job two days after my 40th birthday in 2016, I was persuaded not to resign at the time, but I was resolute to live my dream. I thank God that the challenges I faced earlier in life helped shaped the man I have become. Like I said, I studied Finance. While in was in my third year at the university I told myself that I won’t work for anybody in the nearest future. I started out in the marketing department of a fashion firm whose owner currently resides in South Africa at the moment. I pioneered the first fashion week in my school in conjunction with the Student Union Government. Before I finished my studies, I was employed in Mr. Adedapo Adelegan’s company (Who is the current President, Nigeria- British Chamber of commerce); Benjamin Black & Co (the pioneers of electronic bill boards in Nigeria) and Celtron Nigeria Limited respectively as a marketing Executive and later I was promoted to Client service Manager. From there, I develop more interest in Advertising, Media, branding and Marketing. Prior to this, I had one of my pastors pray for me and it was confirmed that it was the right path of career for me; all I needed was patience, hard work and perseverance. How did Bond and Templers take off? I started with the registration of the company in 2005, as an enterprise but was later changed to a limited company in 2010 and in 015, it was registered in Southern Africa. I conceived the name while I was praying to God some years ago. Bond means an agreement between God and myself, and the people who dwell in the temple are called Templers; so I, my wife, children and staff of the organization are his Templers. Note, if you have a deal with God, you can never go bankrupt. What are your Values and Philosophy of Life? The basic one is taking life easy; whatever tragedy that may happen to you, don’t apportion blame on other people rather see it as a challenge. Whatever terrible situation you are facing right now, pick the best out of it. I don’t take NO for an answer and the challenges I face help me to have a rethink about life. I see life as a school, so discouragement is not allowed and everything can’t be always rosy as we want them to be. What are some of your Business Challenges? Now we are currently faced with recession but God has been our help; our branch in South Africa has drawn many international clients to us. Secondly, the inflation of dollar rate hasn’t helped those of us engaged in international business regardless we still have to deliver top notch services to our clients. The Advertising and Media industry face crunchy times presently due to the dearth of funds. How do you think the Government can Regulate Policies to Boost the Operations of Advertising Agencies? There are a lot of regulatory bodies with one policy or the other. The Lagos Signage and Advertising Agency LASAA at a time came up with policies that made some advertising agencies who couldn’t meet with the demands of the policies, shut down their businesses, many of them have collapsed. I am not expecting any favor from the government and I always tell people not to depend on the government. They can look for other jobs to augment their present income because the government would always come up with policies to favor some agencies and disfavor others. Talking about the Government Policies favoring some and not favoring others; don’t you have a body that can take it up with the Government? We are Nigerians, we always adapt to things easily even if when we complain in our closets nobody wants to take the lead because those who encourage you from the start, might end up betraying you. The cross is now left for you alone to bear, so we just have to accept these policies and blend well. What is the Unique Selling Point of Bond and Templers Limited? Our clients can testify to the kind of service we deliver. We always go the extra mile for all our clients. We just tell them to go to sleep while we take the stress off them. We make sure we deliver our jobs on time without complains, no matter the budget of our clients. We make sure we deliver quality jobs with great value, and its uniqueness is exceptional. What are the companies you work for? We work with so many companies, like Leadway Assurance, Unilever, Johnson & Johnson, Ibex, and GE. What is the new Innovation in Advertising? It is digital marketing; we are in the 21st century where technology holds sway. You don’t need to work down a major road before you see an advert; you can easily see that on various social media platforms. This is what the new generation has and that’s why business owners are churning out money for their adverts to run on social media. We have a lot of big competitors, such as Insight communications and other big advertising agencies, handling bigger jobs. Our aspiration is to grow bigger with the times. For us at Bond & Templers, still striving in the midst of the present economic situation in Nigeria is a great achievement and the ability to birth other companies thereafter would be the icing. The All Progressives Congress Youth Organising Secretary Lagos State, Aregbe Idris has tasked the youths on nation building as a key in pushing the boundaries of innovation and growth in Lagos and Nigeria. Aregbe made this known over the weekend at a two-day event tagged “Entertainment as a tool for nation building” at LA Campagne Tropicana Beach Resort, Ibeju, Lekki, Lagos. While stressing on the need for innovation, Aregbe noted that the youths remain sacrosanct to the growth of Nigeria and concerted efforts must be made to build the country of our dreams. 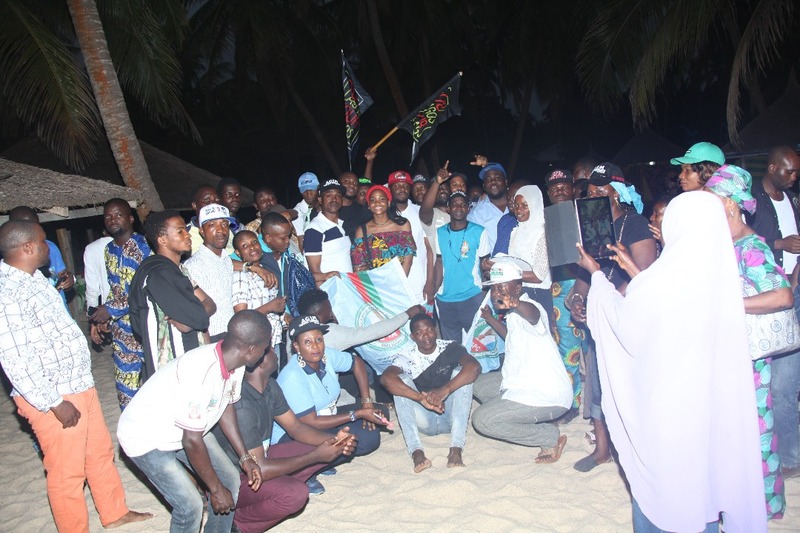 “The youths have vital roles to play in growing this nation,” he added. The two-day event kicked off with a roundtable discussion where hundreds of youths from different corners of Lagos gathered to share views and insights on possible measures to adopt in pushing the frontiers of innovation and development of the state and Nigeria at large. Talented musical stars took turns to thrill the youths to tracks off their albums. With the likes of Dede Mabiaku, Alhaji Malaika, Adekunle Gold and other fine artistes guests were given a full doze of unsullied entertainment. The two-day ceremony was crowned with a pool party hosted by talented music artiste, Falz. Suites Lagos, with the theme “Winning with Tenacity”. The Annual PEARL Awards nite has been a platform where quoted companies and key stakeholders in the capital market are rewarded for their contributions to the growth of the market and the economy in general. According to a release signed by Olalekan Adekoya, Secretary, Board of Governors, this year’s edition promises to be an outstanding nite of glamour, funfair and celebration of excellence. Additionally, there would be other side attractions that will include exclusive red carpet reception, cocktails and high class executive networking opportunities and so on. This year’s event, will host the ‘who is who’ in the corporate Nigeria, and will feature Awards in 3 broad categories, namely, Main Competitive Category; Special Recognition Awards Category and Honorary Awards Category. The Main Competitive Awards would be determined using globally acceptable parameters that include Turnover Growth; Return on Equity; Profit Margin Ratio and Share Price Appreciation among others. for Operational and Stock Performance based on objective and globally accepted parameters, thereby enhancing vibrancy, growth and development of the market. edition would be published in hard copy and presented publicly at the annual Awards Nite. The objective is to make it more practical, analytical and readers’ friendly in line with technological changes in the environment, “ Adekoya added. Traditionally, the telecom industry has been dominated by a handful of large players and due to lack of competition, they did as they like. However, this is now changing with new entrants offering better solutions combined with exceptional customer service. Cloud PBX provider Euphoria Telecom believes providing a world-class customer experience is the key to becoming a leader in the telecoms space. It says this is especially true in smaller economies like South Africa where business is highly competitive and customers are extremely valuable. Telecom companies now have to offer exceptional service if they are to attract and retain customers. The local market doesn’t have the huge customer volumes like the US or the UK, so every single customer is valuable and needs to be treated with care. In 7 years, Euphoria Telecom has earned the reputation of delivering remarkable customer experience to over 2000 business customers – by simply listening to its customers and gaining insight into what really makes its customers happy. “For any tech business, it is easy to lose focus of the end user and place all the importance on the technology – forgetting that the main reason the business exists is to serve its customers. It may seem obvious, but many organisations fail to make a differentiation between incredible technological leaps and delivering incredible user experience through technological leaps,” he concludes.